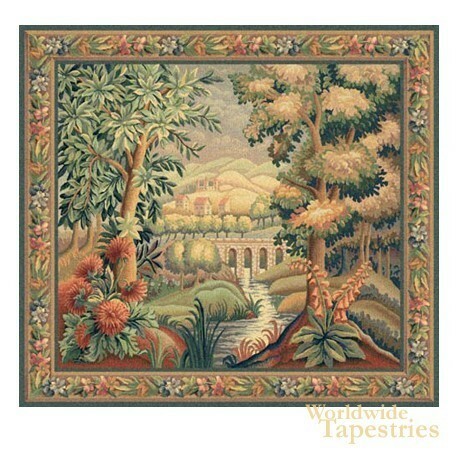 In this verdure Bridge without Bird tapestry, based on verdures of 18th century France, we see a scene from Aubusson in the rich colors of autumn. In this scene of verdure or greenery, where the focus in on landscape and foliage of the natural environment, we see a gentle river leading towards a bridge to the village in the distance. In 18th century France, the verdure landscape was considered one of the most beautiful forms of art as royal homes and palaces endeavoured to bring the beauty of nature into their homes and palaces. In this tapestry, the autumnal colors of green browns and reds are accentuated and highlight the change in season from summer to the cooler climate about to come. This tapestry with its gorgeous detail and color brings beauty and serenity to any room or home. Bridge without Bird tapestry is lined and has a tunnel for ease of hanging. Note: tapestry rod and tassels, where pictured, are not included in the price. Dimensions: W 55" x H 52"